We sat on the tracks and waited. 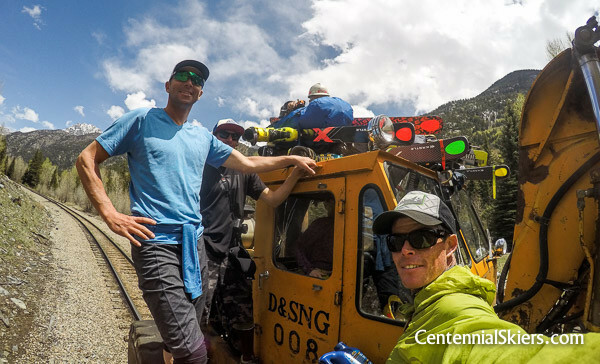 In all of our trips to the Weminuche Wilderness we’ve never seen the train run late. Ideas were floated as to what could explain the delay— rockfall or a mudslide that blocked the tracks seemed the most plausible explanation. But as our patience got tested, the notion that maybe a “zombie apocalypse” occurred while we were away became the most entertaining scenario to consider. We pondered the decisions that would have to be made in that event. We would stay where we were, in the little outpost of Needleton. Ian said we could likely hold off the zombies at the bridge. 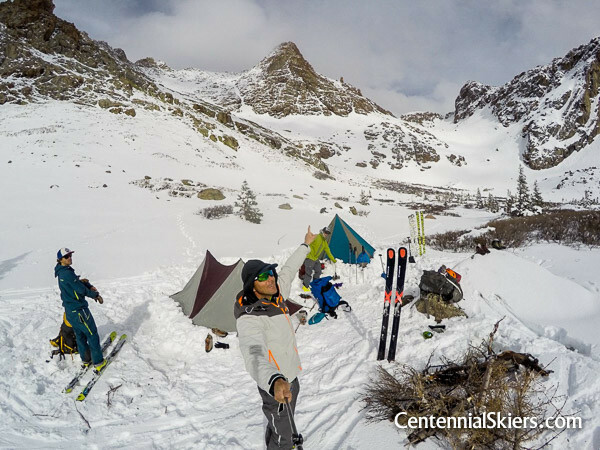 A few days earlier, Christy, Dav, Ian, and I got off the Durango-Silverton Narrow Gauge Railroad here with the goal of heading up to ski two of our remaining Centennial Peaks— Pigeon Peak, 13,972 ft., and Turret Peak, 13,835 ft. We paid a visit to these two remote summits during our Weminuche Traverse (read here) this time last year, but the wind and weather forced us to turn back. We carefully considered the options for our eventual return here today, and ultimately decided on a multi-day approach via North Pigeon Creek. 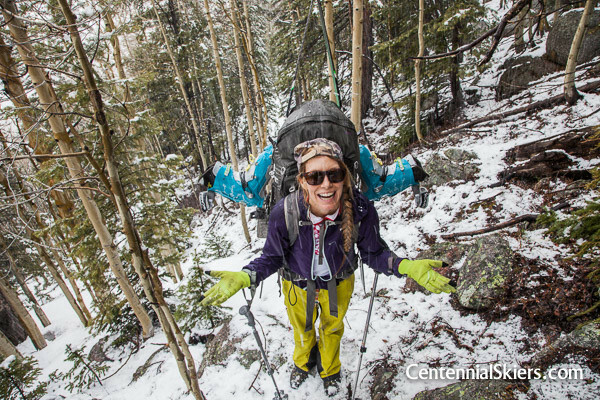 A trail-less route up North Pigeon Creek, with wet feet, massive packs and messy weather. FUN! Nearing treeline, at the head of North Pigeon Creek as Pigeon Peak rises into the clouds. The beastly packs were strapped to our backs and we headed up the extremely steep trail towards Pigeon Peak. As we climbed higher the trail became more and more faint until it faded to nothing. As we clumsily maneuvered up through the forest, the tips of our skis caught overhead branches and our ski boots clipped the trees to our sides. The wet May weather we’ve been experiencing came through in waves, first as rain down below, and then as graupel and snow as we got higher. 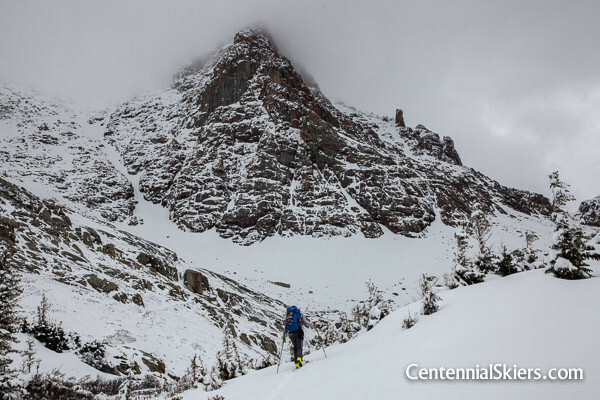 Eventually we reached the high basin of North Pigeon Creek where we set up camp, in an “idyllic” place according to the guidebooks, but one that became pretty harsh when the spring squalls came though. 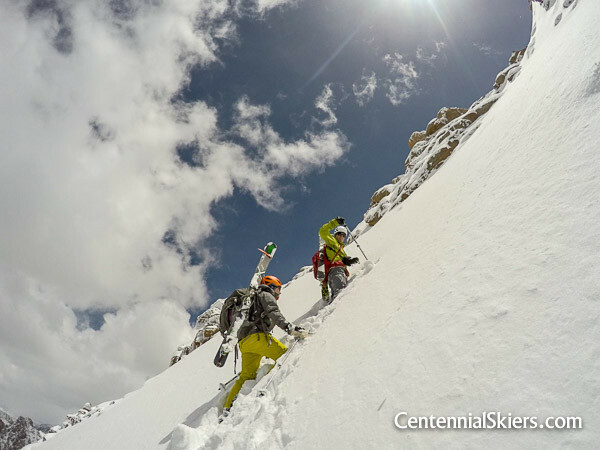 We set up the ‘mids, built a fire, ate some freeze-dried’s, drank some fireball and whiskey— basically we got ourselves ready for the attempt on the two 13ers the following morning. With camp setup, we could see some of the next day’s goals. The small gully heads up to the left of Pigeon Peak, and the notch to it’s right gave passage to Turret, which we headed to first. Weather kept coming in from the west. We were pretty exposed. Getting ready for the next day’s effort. None of us really slept. 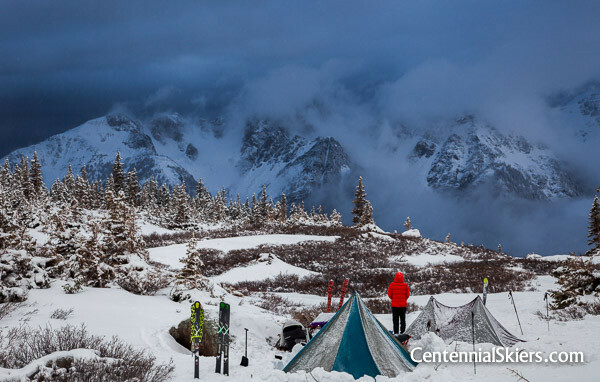 Stormy weather persisted most of the night, sometimes with lightning and “snow thunder” that rattled the nylon tent walls and left new snow everywhere in its wake. Thankfully, by morning the worst of the storm had seemed to pass. The day was forecasted to be calmer, but it was a short window before the next disturbance was supposed to arrive. We knew this was the only opportunity we would get, so we packed up our things and made our way towards Turret Peak. Over the ridge out of North Pigeon Creek, we approached the Pigeon-Turret saddle, seen here, from the south. Turret’s west side is ahead. It was a much calmer day than the last time we were here. Pigeon Peak stands behind. We skinned up and out of the North Pigeon Creek Basin and towards the south side of the Pigeon-Turret saddle. One year ago to to the day we reached this saddle from the north (from Ruby Creek) and found ourselves in wind so strong it picked up Ian’s skis and launched them down the valley. 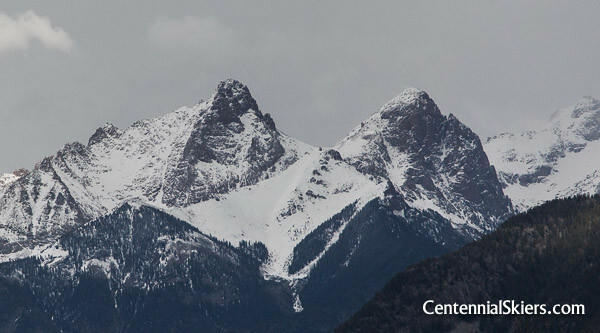 The decision was made for us, the conditions wouldn’t allow us to ski these two peaks. We would have to come back and try again. It was a big disappointment. Dav and Ian top out, with the impressive lineup of Weminuche peaks in the distance. And so one year later we were here again, and this time it was calm. 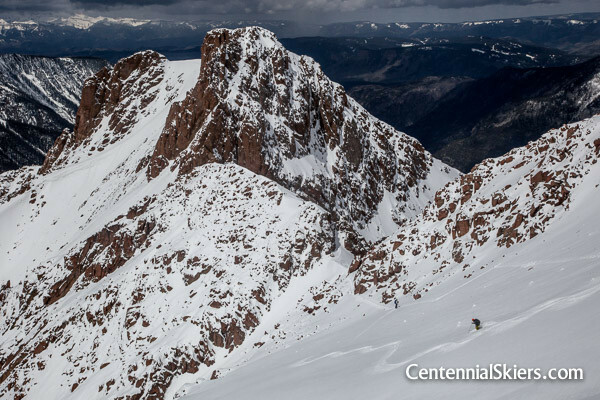 We climbed to the top of Turret Peak, 13,835 ft., caught some incredible views, and readied to ski back down. 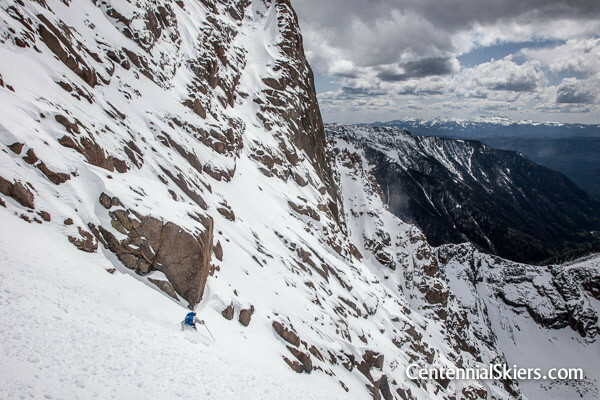 From what we’ve gathered in our recon, Turret’s summit is often dry, and we were actually lucky to have been able to ski right off the top. It only took one turn to realize we were skiing new snow atop rocks though, so while it wasn’t pretty, we made it work. 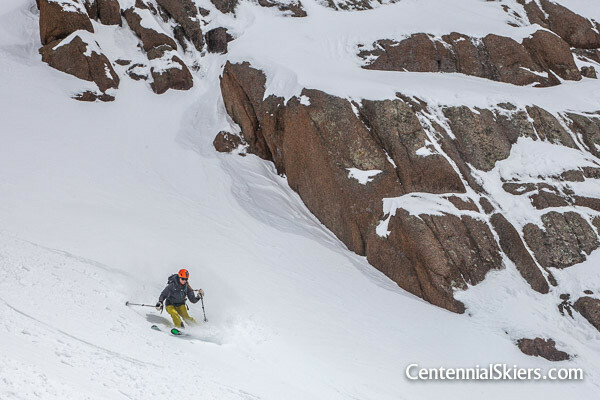 Centennial #97, check. 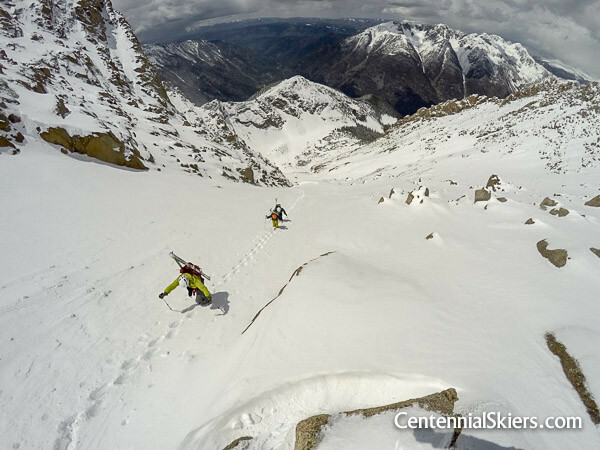 Skiing thin snow back towards the saddle. Spring weather continually moved through all day. Skiing back down to the notch in the ridge we came through earlier. The snow was much better down here. A moment of sun and powder before starting up Pigeon. The skiing improved as we made our way back down to the saddle. 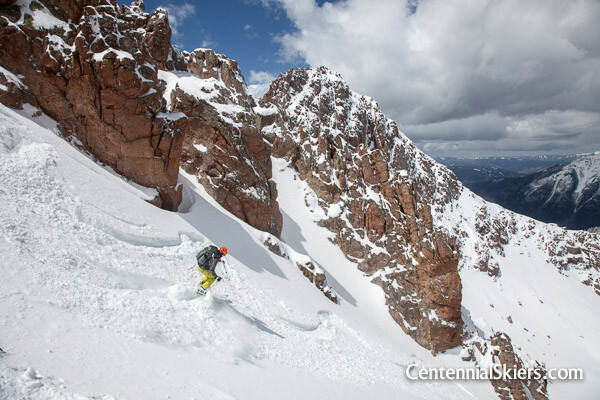 We passed through the notch and back down towards North Pigeon Creek, skiing around the steep walls of Pigeon Peak. 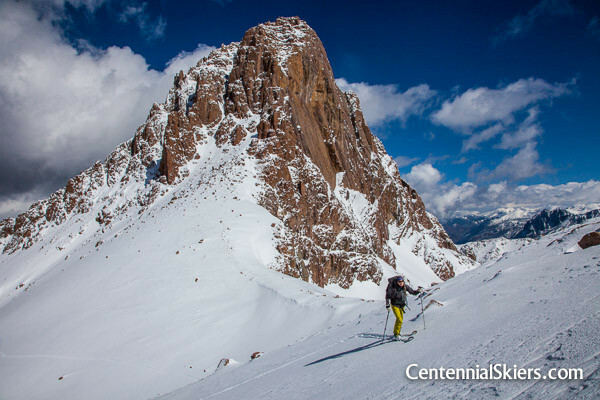 The only feasible route to climb and ski Pigeon is on its west side, where reasonable terrain (read: not vertical rock) leads up towards its summit. We headed to an obvious gully, first skinning until it got too steep, after which we started booting up. As we got higher the snow got deeper and deeper, and as the slope steepened, the act of climbing felt more like we were plowing a trench than kicking steps. 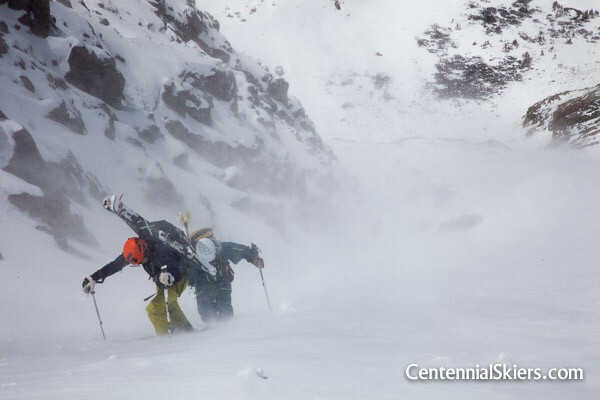 At times the snow was thigh deep, and we would take short turns in lead and then switch as needed. Spring weather continually passed through. And in a couple of places we noticed the recent snow, about 6-8 inches, was wanting to slide off the underlying surface. Climbing up the gully in more random weather. From camp the gully didn’t look too long. It’s deceiving. Just as it seemed to be getting too deep and steep to climb any higher, we reached the summit ridge. 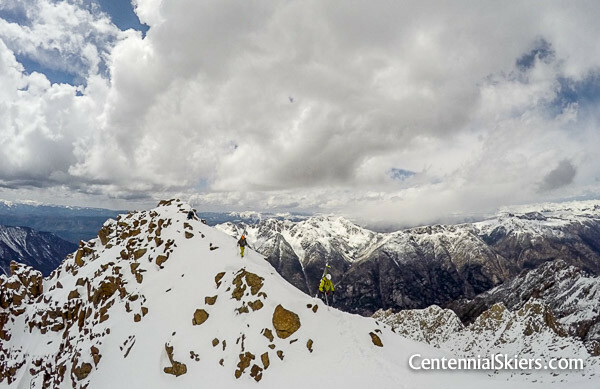 And soon thereafter we were on top of Pigeon Peak, 13,972 ft., the 4th highest Centennial, and surely one of the cruxes of this whole project. 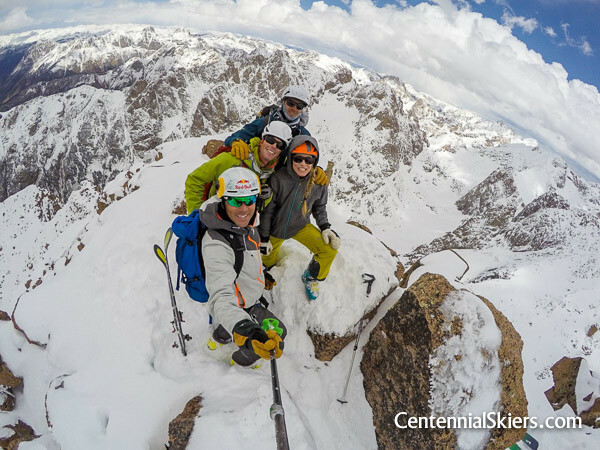 We snapped a few photos, packed away the climbing stuff, and got ready to ski. What a treat, we would be able to click in on the actual summit and ski all the way to our camp, which we could see down below. 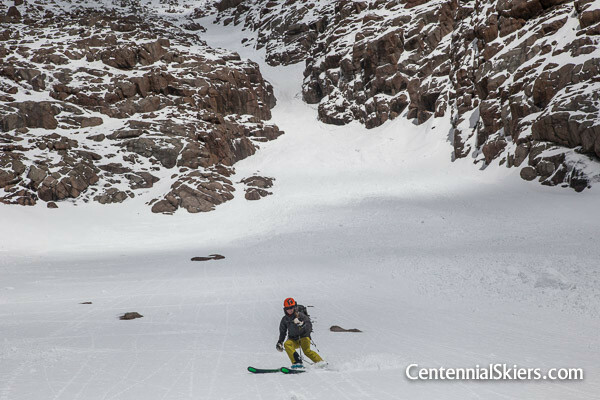 But there was one important thing to consider— the new snow slab we saw on the climb. 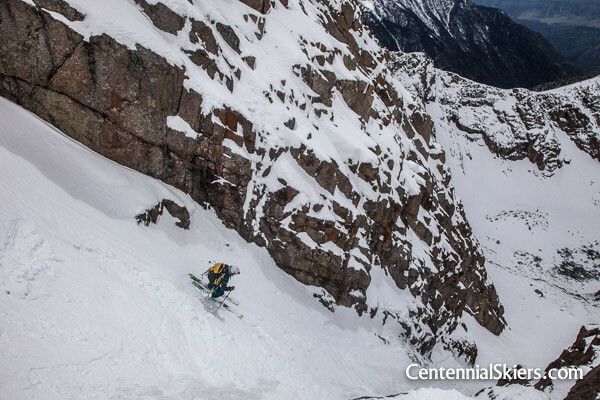 We started down, making a couple of careful and deliberate ski cuts, which sent the soft snow slab down the mountain, clearing the hazard and leaving the more supportive bed surface for us to ski. 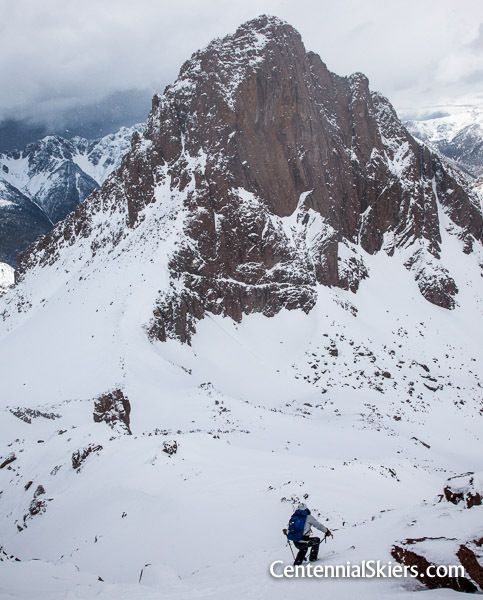 Once through Pigeon’s upper steep sections, we followed the gully all the way down to treeline. 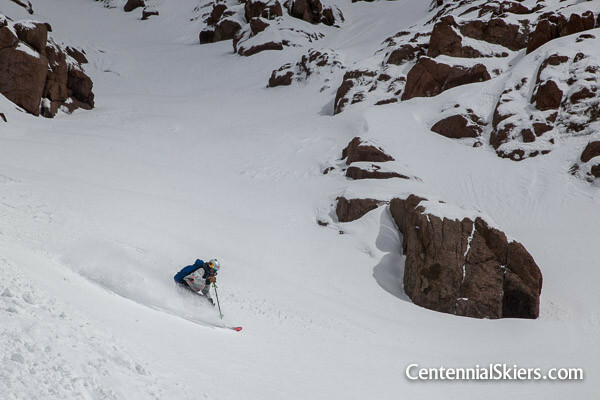 Once through the mountain’s upper intricacies, the skiing was really good. Through the gully and all the way down to camp. 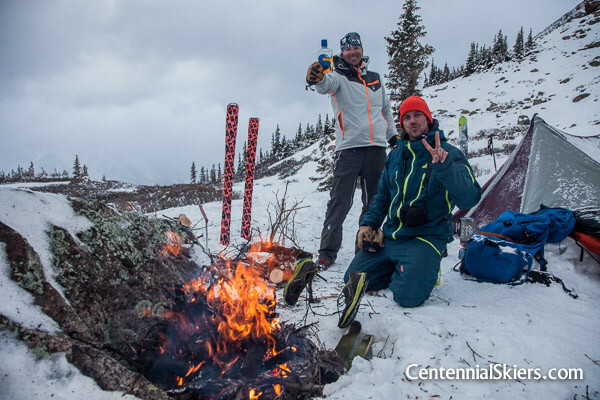 Back at camp we acknowledged how fortunate we were to get these two remote peaks skied, considering the their technical nature, the weather and the new snow. It was early in the afternoon so rather chance another potentially restless night at 11,600 feet with more bad weather approaching, we packed up and went back down to the Animas River. 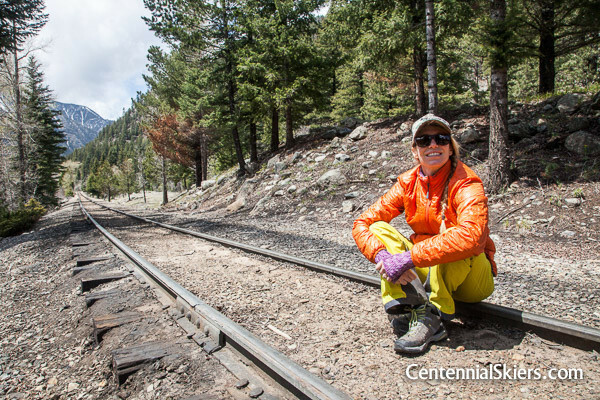 It was a big effort after a long, two-summit day— it’s about 6,000 feet down from the top of Pigeon to Needleton— but a low camp in a grassy meadow with a fire sounded nice, and we would be in good position to catch the train in the morning. Trying to dry out and relax at the Upper Camper’s Meadow. Down at the Upper Camper’s Meadow it rained on us most of the night as we slept, eventually turning to snow. 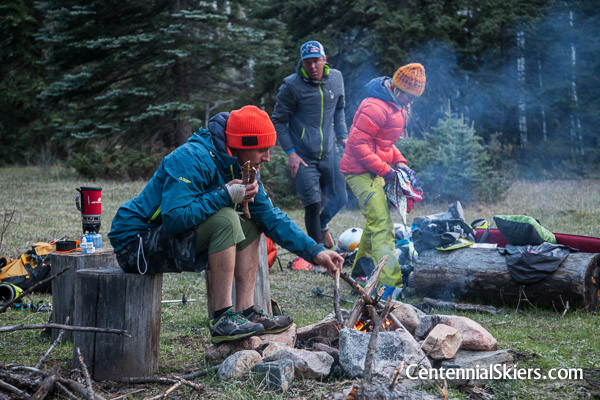 We could only imagine how uncomfortable it would have been up at high camp, had we stayed. And so there we were the following morning, sitting on the train tracks, waiting. Zombie Apocalypse? Rockslide? We didn’t know. We were so happy to have skied Pigeon and Turret it hardly mattered. Eventually a tiny train car with a big crane came rolling up, hours after we were expecting to be picked up, and informed us of a rockslide that destroyed a section of the track. It occurred the night after we were dropped off, probably the result of one of the passing waves of weather that made it so miserable for us up in camp. Loading the packs on whatever you call this piece of machinery. How we roll? Christy was riding shotgun. 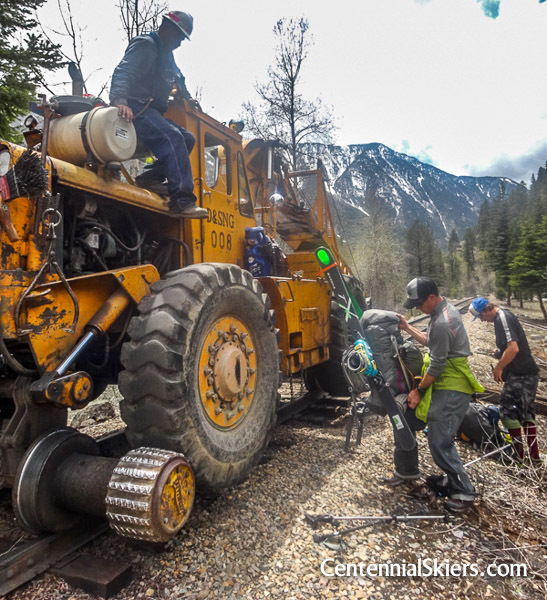 In a most unanticipated and slightly surreal ending to our trip, the rail workers loaded our packs on the roof of the crane that was hauling replacement railroad ties, and gave us a ride downstream to the mangled section of track, as we hung on to the outside of the cab. We hopped off the crane and talked with the rail crew for a bit who were working to repair the track. Pigeon and Turret were in clear view as we explained what we were doing up there. Most of them were at least curious, some of them actually seemed a bit impressed. 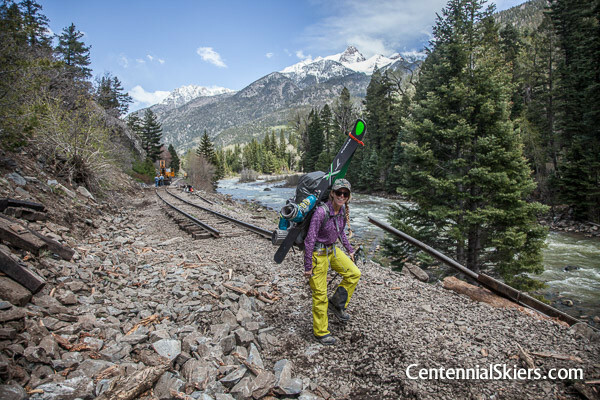 We loaded ourselves and our packs on a smaller train car and rode the rails back to our cars in Rockwood, 12 miles away. At the rockslide, switching rail cars, Pigeon and Turret were in plain view. It would have been nearly 14 miles to walk out from Needleton. What an adventure. Turning back on Pigeon and Turret last year was a big let down at the time. But looking back, the opportunity to return here a second time has added immensely to the experience. We had the chance to see a new side of these mountains, to camp in a new basin and approach up a new valley. We saw different weather, better snow conditions, no dust. As a group we had more time out in the mountains together, something we all love but don’t get to do enough. One year later that initial failure has now actually become part of a larger success. Go check out Pigeon and Turret. You won’t be disappointed, no matter how your fare. Pigeon and Turret. What a pair. The ski lines are somewhat visible.